TM Forum presents Esri, BaseN, and Infonova the Most Significant Contribution to Frameworx Award. From left to right: James Hitchcock (TM Forum), Patrick Huls (Esri), Dave Twichell (Esri), Anders Viden (BaseN), Vedran Bratic (Infonova), and Nik Willetts (TM Forum). Redlands, California—Technology giant Esri swept two of three awards at TM Forum’s Digital Disruption December 2014 conference in San Jose, California. Both awards honored contributions to the Internet of Things, a futuristic idea for connecting smart devices to have a positive effect on society. “Managing and understanding the interaction of all the connected devices that exist—this is today’s hot telecommunications opportunity and challenge,” Esri telecommunications industry solutions manager Randy Frantz said. 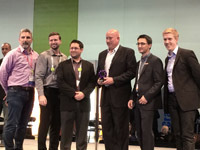 Esri took the Most Innovative Catalyst Award for its Smart City: Empowering Governments, a proof of concept showing how companies can leverage the Internet of Things in upcoming solutions. TM Forum gives the award to teams that best demonstrate an inspirational, high-growth-potential business concept that’s likely to have a positive effect on society. Esri shares this award with its teammate, ISPM. Smart City empowers governments to collaborate faster with service providers and private enterprises. The proof of concept points to Aguas de São Pedro, a Brazil municipality currently transforming into a smart city. “We show how organizations could talk to each other under these guidelines,” Esri technical evangelist Patrick Huls said. Esri also took the Most Significant Contribution to Frameworx Award alongside teammates BaseN and Infonova. TM Forum awards this to the team that best evolves TM Forum’s flagship Frameworx suite, a proven model of best practices and standards for telecommunications companies. Esri and its team’s winning proof of concept was Smart Energy: Realizing the Digital Handshake. Smart Energy outlines a solution that integrates and digitizes energy management on a smart grid. It demonstrates how to keep the power on during and after outages. Smart Energy also addresses grid challenges including climate change and growing energy consumption, rising price, and theft. TM Forum announces Catalyst Awards biannually. Winning teams leverage proven technologies, competencies, and investments. Teams have six months to develop proofs of concept that outline digital solutions to today’s biggest telecommunications challenges. TM Forum includes more than 900 member organizations and 85,000 individual members.